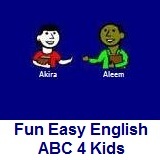 ﻿ Fun Easy English - new writing english alphabet for kids letter l.
Hey kids, try writing the letter L.
I bought a new lamp today. A lion is standing in the grass. A lemon is a yellow fruit.